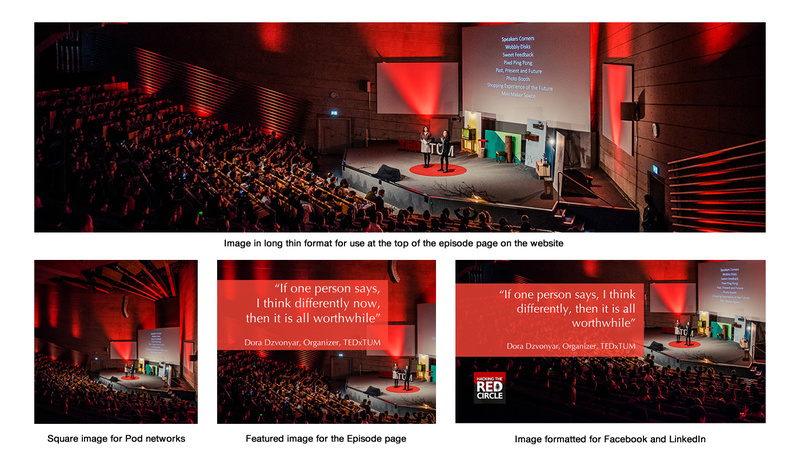 The Hacking the Red Circle podcast features stories with fascinating people from the TEDx universe. We talk with people who are just starting out on their path as well as with those who have been doing events since TEDx began in 2009. We encourage you to listen to a few shows before you join us. Click on Episodes (above) and find a few to investigate. The show is 30-40 minutes long, though we sometimes go a bit longer. We record on an irregular schedule, as our guests are from all over the world. Our studio is based in Santa Barbara, California and we’re on Pacific Standard Time. Once we’ve connected with you, we will have our scheduler Amy, work with you to find a time to be on the show. We typically record a month in advance of publication. We produce the show on alternate Tuesdays from our studio in Santa Barbara, California. Because you are probably in a different time zone, we’ve set aside morning and late afternoon recording sessions that correspond with every timezone. We’ll make it work to fit into your schedule. Once you’ve contacted us (see form on the home page), you’ll get an email from our scheduler. We are typically booking new shows about 3 months in advance, then posting them about 2 months later. There’s a lot of Organizers to talk to! Please send us a photo that is representative of your event. Take a look at the Episodes page on the site to get an idea of how the photo is used. See the Photo section below to get the exact size we need. If there are any particular videos, links or photos you think will enhance the experience for the listener, and reader, please send them in advance. The podcast is very simple and straightforward. Mark will take you through a series of questions in a conversational format. Download the questions, if you’d like to see them in advance, or be surprised! We record using Zoom which means you’ll want to be in a quiet room with the doors closed; any extraneous machines turned off and a good pair of headphones. It’s important that you test your audio before we record. Please have an external microphone/headphone. Talking to the display audio or built-in microphone doesn’t give us a quality audio signal. If this happens, we may need to reschedule. When will the episode be available? Your show will be posted approximately 6-8 weeks after recording. Show notes will be on your event’s page at HackingTheRedCircle.com, then cross-posted to iTunes, Soundcloud, Stitcher, TuneIn and the major podcasting networks. We will send you a link to the page so that you can fact-check it before we go live. Thanks in advance for being responsive. We also enable sharing of your show so you can easily embed it on your website, in a newsletter or post to LinkedIn and Facebook. We encourage you to notify your mailing list, attendees, Organizing Team, and social media networks when the show launches. We’ve seen spectacular results when you amplify what we do and tell the world about your amazing show. We will need a high resolution (at least 1800 x 1200 pixels) photo from you in a landscape (wide) format. The photo will be used to promote your episode on various podcasting networks, social media, the Hacking website, and iTunes. Please send the photograph once you have confirmed your time slot, to our scheduler. Ideally, it’s a wide shot of your stage, or it might be attendees and be sure that your event logo is visible and if there’s a subject, that it is positioned in the center of the frame or lower center. We try to make one image serve for many purposes, hence our being so specific. You will get an email from us confirming your interview. It will include a link to this page, which has everything you need to know. We typically book shows 1-2 months in advance. We will send you a reminder note a day or so before you’re going to be on the show. If you can’t make the interview, please send us a note and we’ll reschedule you. Things happen. Don’t worry about it. Email reply to the confirmation letter we send you before your episode. We want to be sure nothing changed and that you’re still going to join us. Give us your SKYPE handle and cell phone; sometimes we need to get a hold of you on the day of and it’s easier to call than email. Be sure you’ve sent us a WIDE photo in advance. That’s so we don’t have to chase you down during our production cycle. We can’t release your show without it.